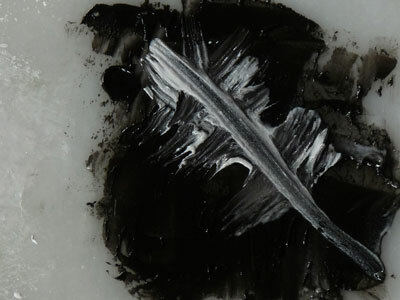 It's always seemed best to follow a physical energy in painting: paint first, ask questions later. Different kinds of work get generated this way, but over time the differences seem to inform, or cross-fertilize one another. This process has been fascinating: it all comes from me in theory, but I often have no idea what is going on, am often puzzled, trying to catch up with where the process is going. Learning to wait and see has been a big lesson, patience a learned behavior. 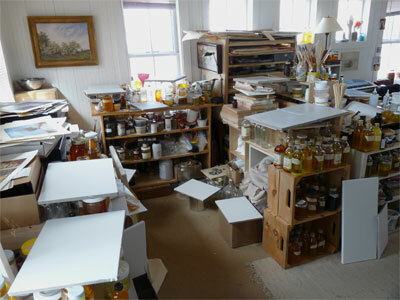 The process is willing to teach all kinds of things I had no idea existed, but in discreet increments, not all at once. The key seems to be to let go of what I think, and work with what I feel. And this can be many things as well. But it's led to a process to believe in, a relationship to trust as a guide. The first work was relatively literal, isolating various objects of interest on a numinous stage. 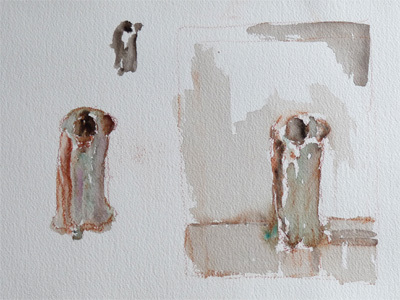 These taught me a lot about the basic narrative language of painting. For example, something could be implied -- in this case, the flower -- without being stated. 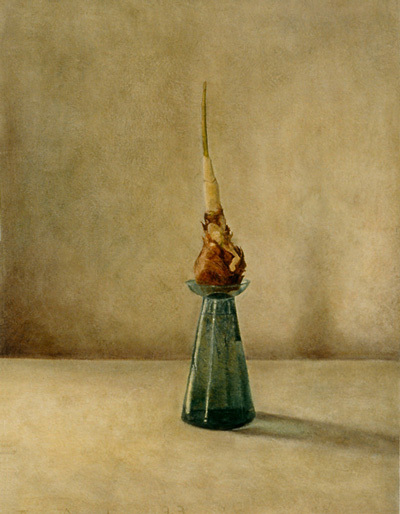 Alla prima painting of an amaryllis bulb from 1993, 20x28 inches, oil on gessoed paper. 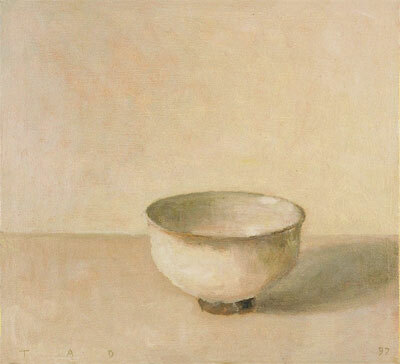 Morandi's work became a lifeline for me, solving the issue of a meaningful path within realism. I worked with many permutations of a similar -- at times very similar -- style for over as decade beginning in 1988. Often this work seemed to also be somewhat Japanese, aided in this case by an antique raku tea bowl that came my way. It soon became apparent that the search for simplicity was complex. More importantly, I realized that exploring this paradox was immensely fulfilling. 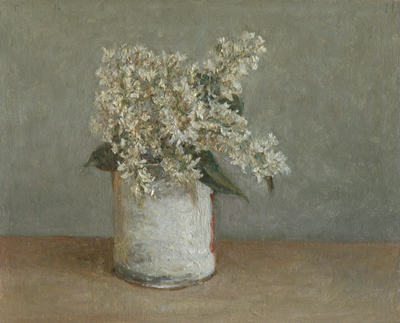 Alla prima, from 1997, 10x12 inches, oil on gessoed canvas over panel. It was also possible to find this Japanese quality in work done outside. 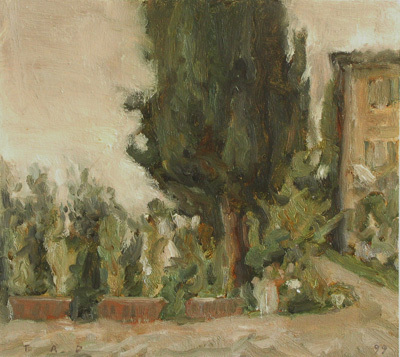 Alla prima study from 1997, 10.5x12 inches, oil on gessoed paper. 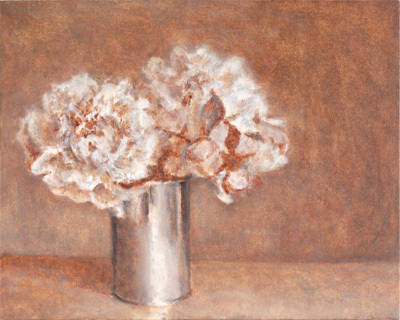 Still life work continued, and it sometimes seemed that even less was more. 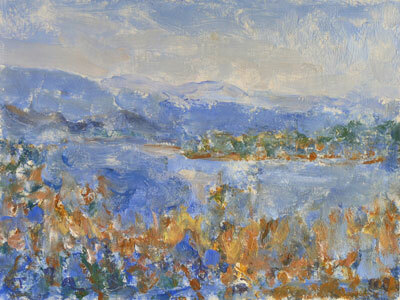 Alla prima study from 1999, 10.5x12 inches, oil on gessoed paper. 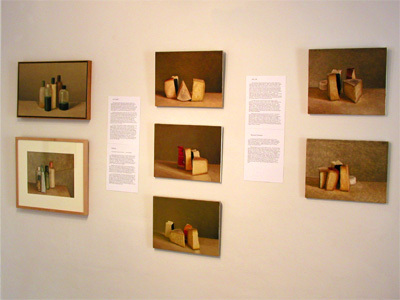 By 2003 I'd found a way of working with the Morandi model that I liked, but also realized that it was time to go my own way. The evanescence might have to be sacrificed, but this would lead somewhere new. 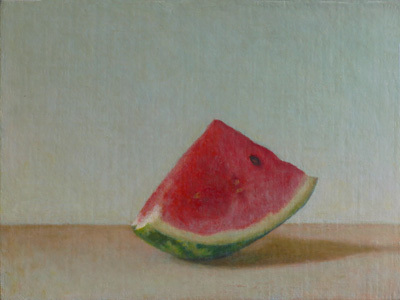 Alla prima still life, 2003, 12x16, oil on gessoed linen over panel. 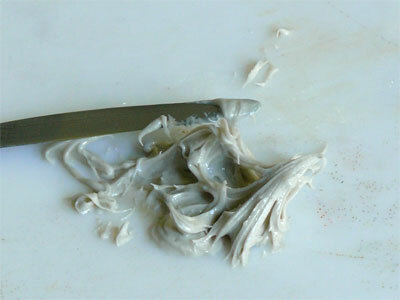 The paint then slowly began to get more solid. 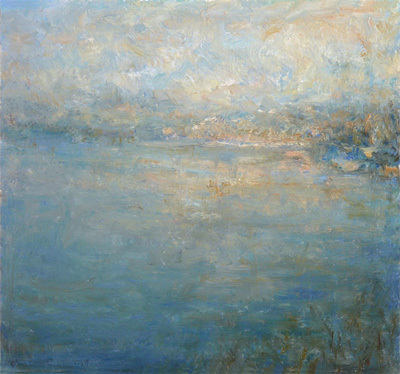 I worked more from life, with more paint, and slowly began to see things more my own way. This was, in its own way, very traditional: learn the teacher's way first, becomes yourself second. 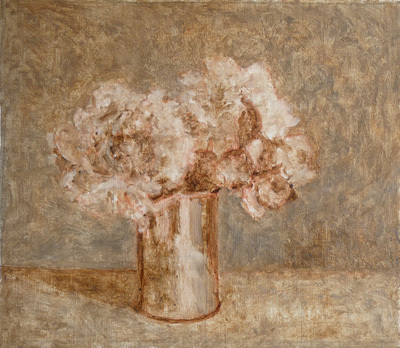 Another alla prima still life from 2004, 12x16, oil on gessoed linen over panel. 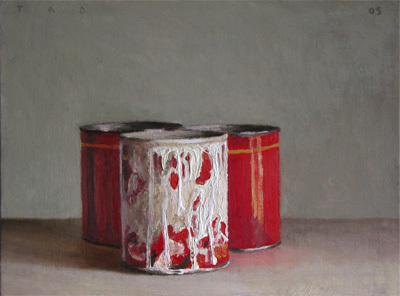 The cans eventually became a series of their own, with many variations on the theme. The tension between their mechanical and human nature was really interesting: how to animate objects whose geometry was so formal? 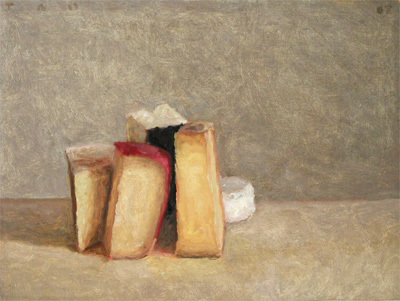 Alla prima still life from 2005, 12x16, oil on gessoed linen over panel. 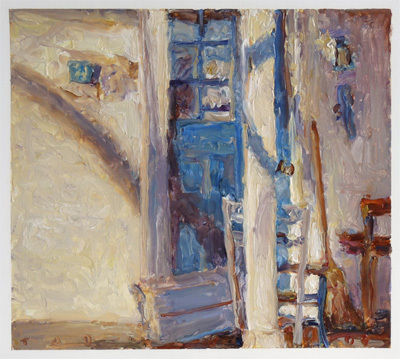 I also made work which was more closely observed, more about color, paint, and the mystery of the object on stage. 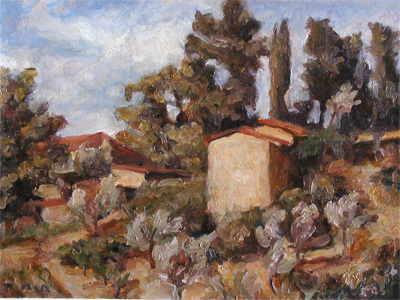 From 2003, 12x14 inches, oil on gessoed panel. It's also interesting to revisit images sometimes and see how their execution changes. From 2016, still in progress, 12x16 inches, oil on gessoed linen over panel. 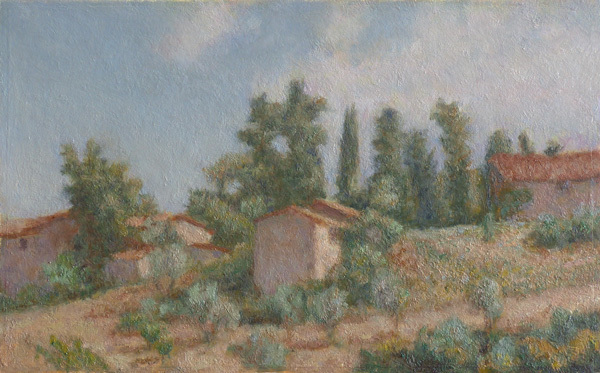 Corot is another painter I've been really interested in. 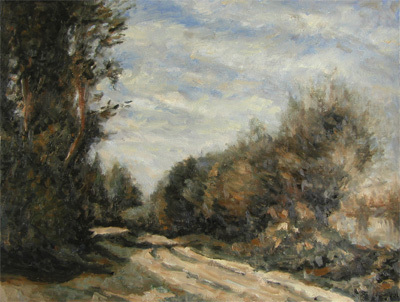 Small copy of his Crecy-en-Brie Road10.5x14 inches, oil on gessoed paper. 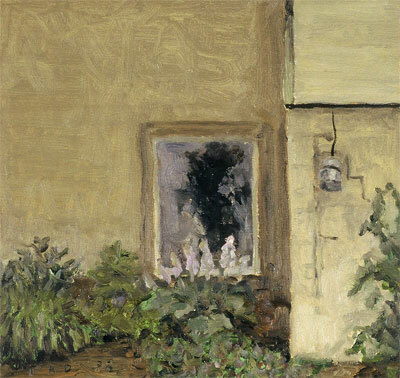 Constable's outdoor work has also been important. 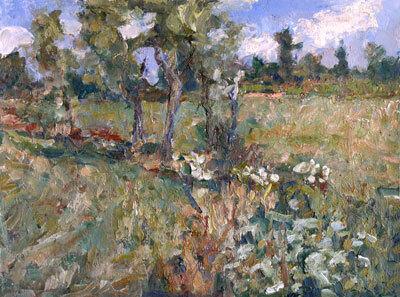 One of several copies made after his first small study for The Hay Wain, an extraordinary painting. 9x12 inches, oil on gessoed canvas over panel. 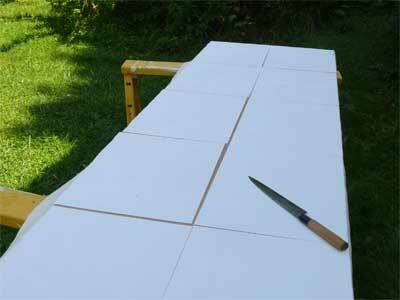 Working outside is important, most often I make small studies on gessoed paper simply working with what is there. 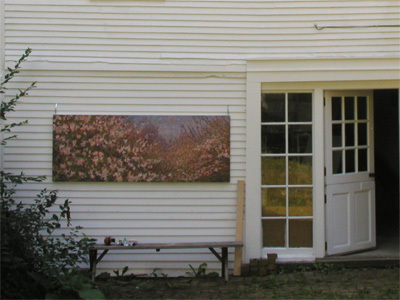 The outdoor work involves a lot of heat of the moment, and seems to anticipate elements that will be coming into the studio work. 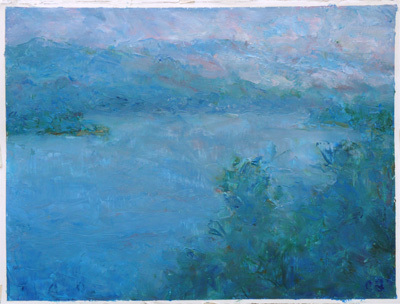 The intensity of the blue and green element in summer has proved to be a perennial challenge. 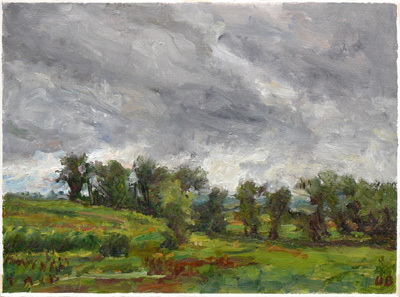 Study from summer, 2008, a front moving into Farr Cross Road early on a summer morning, I was almost blown off the road. This is a place I've painted for a decade, always interesting to see what has changed there. 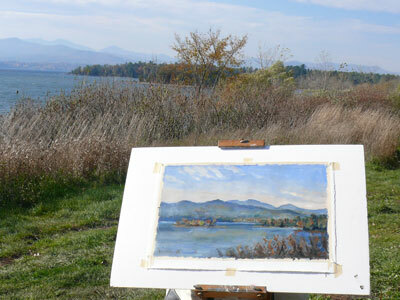 Sometimes a certain location proves to have many possibilities over time, such as this overlook of Lake Champlain at Button Bay. 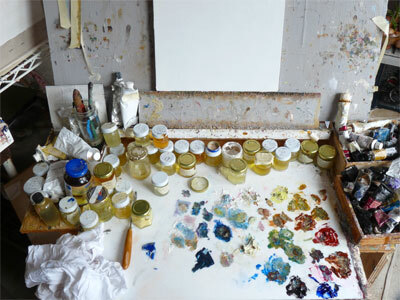 The medium and palette are set up to respond to the time of year. Button Bay, 2008. Sometimes the focus is more on observation. Button Bay, 2008. While a second study on the same day usually produces something more essential or abstract. Button Bay, 2008. 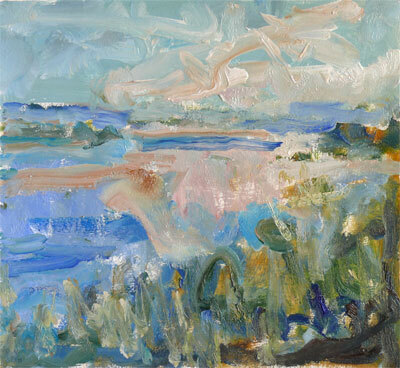 Quick studies from life are also more abstract, as in this early morning storm clearing over Button Bay in 2008. 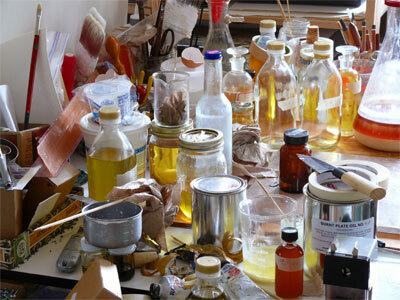 Studies from life can also generate studio work. Usually I work small, but sometimes I work bigger, detail below. 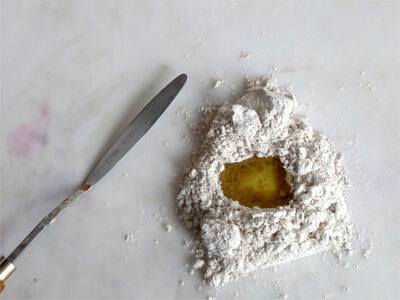 Some of the work has it's origin in two trips to Tuscany, a place that felt oddly like coming home. 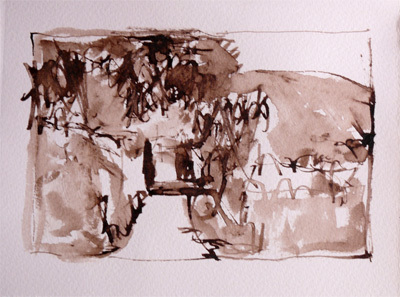 From the first trip, a villa in Pieve di Brancoli outside Lucca. 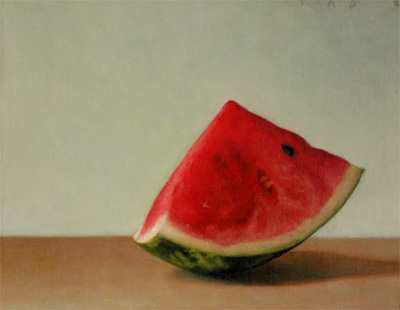 A more recent alla prima version of the same image. From the second trip, a farm in the Mugello region above Florence at the beginning of a thunderstorm. 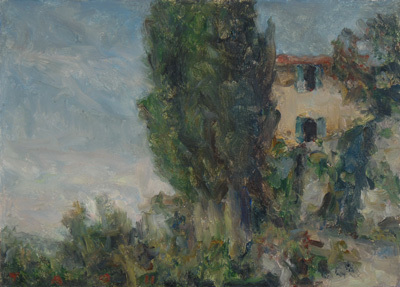 Painters from other countries began arriving in Italy in the late 17th Century, there is a great sense there of something special in the land that has been understood and interpreted in many different ways. I still return to these images as a portal into a calmer world. Study of the same farm, 8x13 inches inches, oil on paper over panel, 2016. 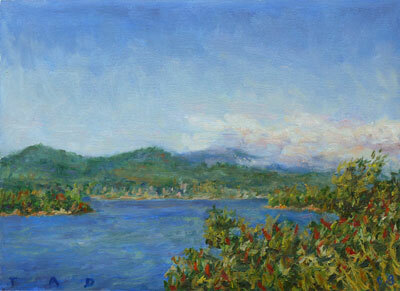 I usually paint realistically, but ever since the 80's I've worked off and on on color-oriented work. This took over full time for a while in 2006. 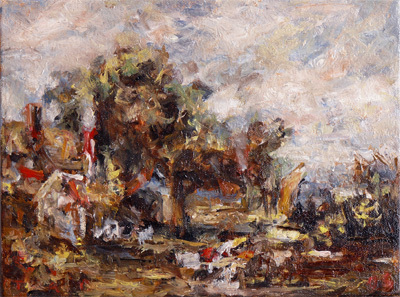 Image here from June, 13.5x15 inches, oil on gessoed paper. Close-up showing the additive-subtractive puns that go on in these. Very fun when the style arrives, but impossible to manufacture otherwise. A favorite from the latest interlude of these, in 2007. I think a lot about the early use of color in Italy, these paintings often seem to be a way to use that interest. The more closely observed work continues, these can take a long time to complete but the closer it is, the more fun it gets. However, these do become difficult to photograph accurately. 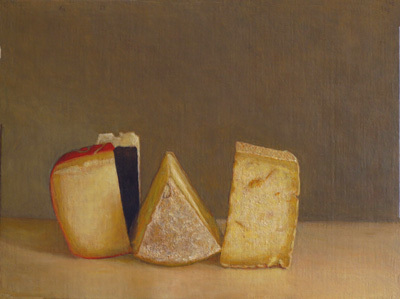 I still think there's something basically comical about painting cheese. 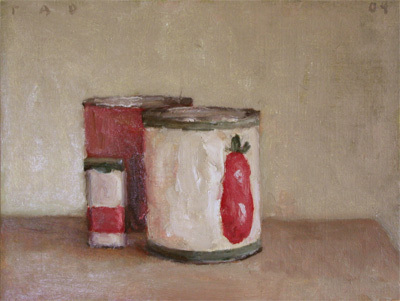 Working quickly alla prima is a good balance to many layers over time. 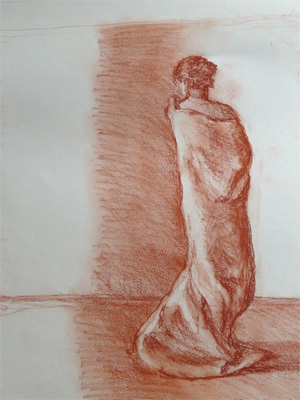 These images are also good ways to try out more visceral or rococo mediums. 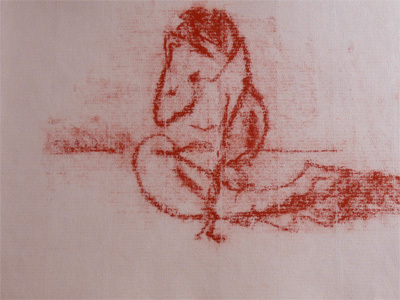 For many years I drew everything in red chalk first. 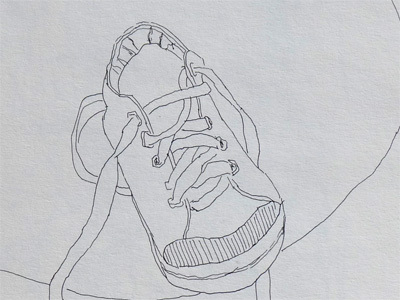 But I've always liked the focus of fine line drawing too. 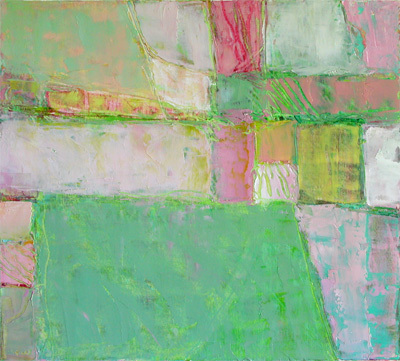 The chalk style can be expanded to include pastel. 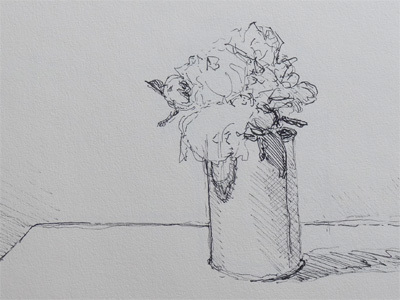 But careful drawing is more reliable in determining whether composition is correct. 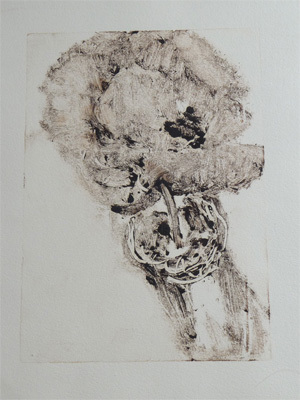 At one point I made lots of small monoprints. 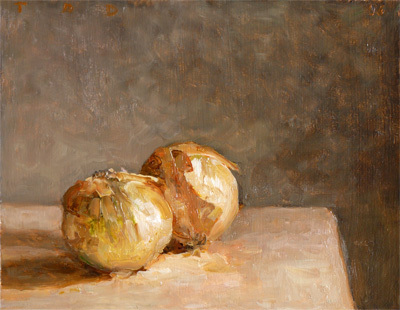 It was interesting to observe the interplay of realism and abstraction in these. And sometimes drawings happen in reed pen. But these are often more like paintings. Sometimes I'll make small watercolors to explore an idea. A step even closer to an oil painting. 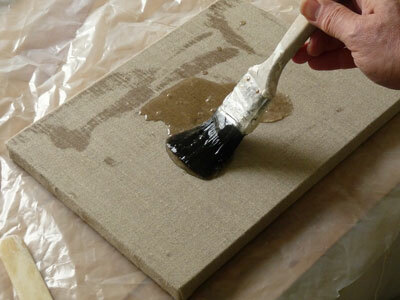 This process in turn helps paintings to begin in a more essential way. Hopefully this quality makes it all the way through the process. I make a lot of the materials I use. It's a fine line between inspiration and chaos. Little changes in well-known procedures can translate into large changes in the way the paint behaves. It took me a long time to figure out not to overheat the glue. 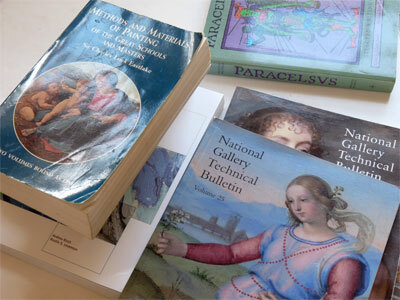 The materials work involved reading the older texts on painting technique, but also the new research, and some period material. 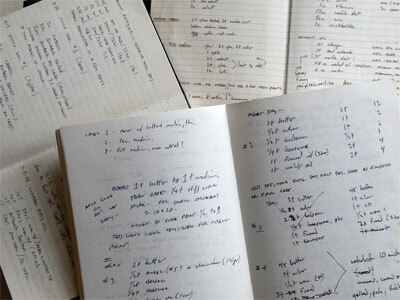 I've learned the value of taking good notes. 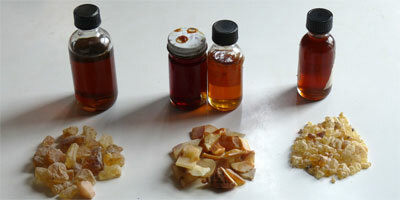 At first I made the hard resin varnishes: copal, amber, and sandarac. Complex pyrolysis is a great way to stay in touch with one's inner ten year old. 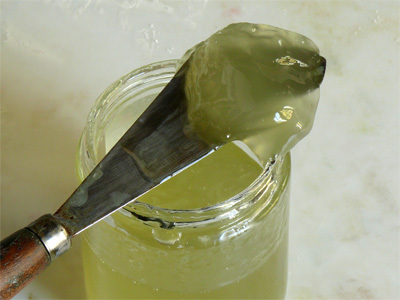 I also experimented with making the infamous mastic gel mediums, very cooperative to work with but definitely unreliable over time. The National Gallery publication "Rembrandt: Art in the Making" put an end to all arcane materials exploration. The technical research in this book suggests that Rembrandt worked with natural chalk and oil. After a certain period of resistance, I had to try it. 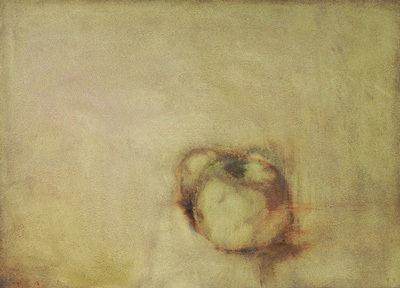 Starting in 2007, this made my life solvent-free, and opened up a whole new world of ideas and possibilities based on the interaction of two simple materials -- chalk and oil. 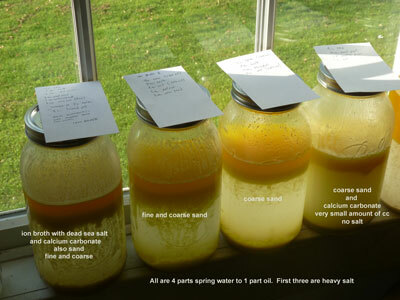 Some of which turned out to have a more complex rheology than others. 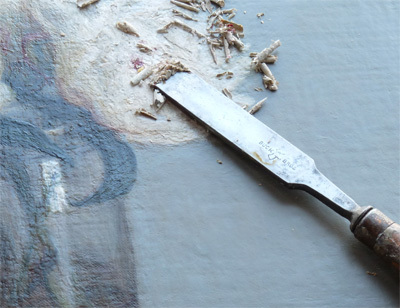 The chalk putty enables the paint to be cut but remain dense, and retain more color than lightening the values with white. 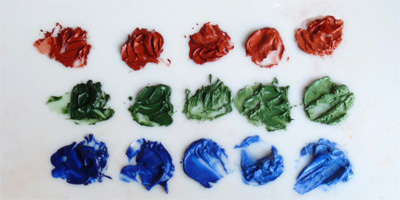 This led to a greater understanding of how older painters were able to get so much color from a limited palette. 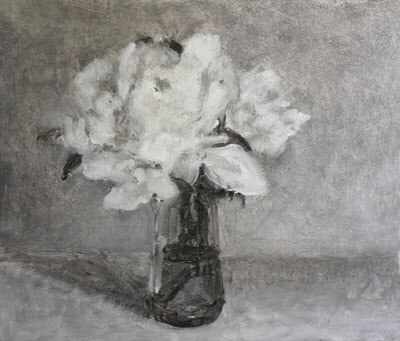 The separation of translucent color without white in the shadows from opaque color with white in the highlights creates tremendous dimensional movement with a limited palette. 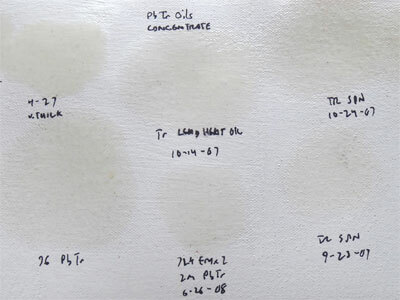 Moving away from resins naturally suggested studying the oil in more detail. 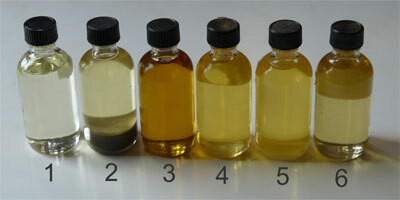 Which has slowly led to greater understanding of how to refine the oil. 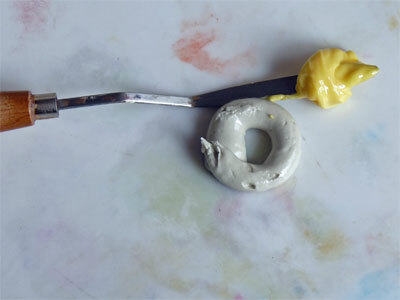 The oil I refine makes paint I like better. 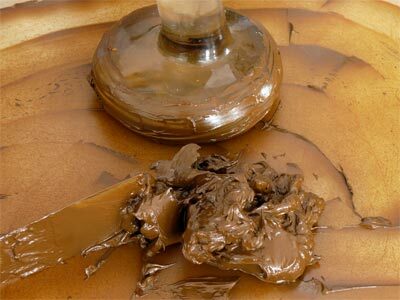 It has more boing, contains only pigment and oil. 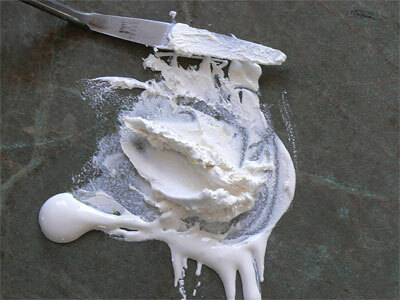 This also makes it more thixotropically reactive to other traditional medium ingredients than commercial paint. 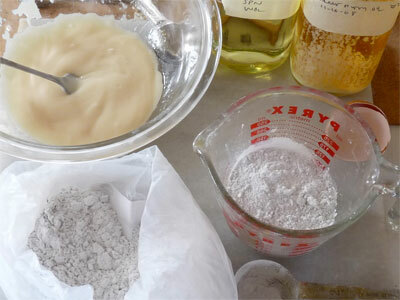 There are many things that happen in relation to the viscosity of the white. 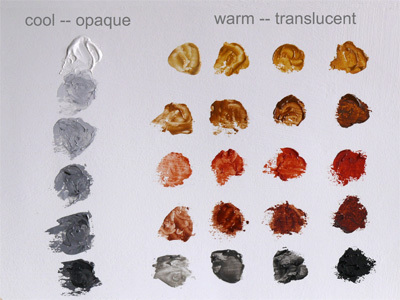 Many different potentials for the paint itself. And some interesting materials that appear to have been forgotten or left behind. But no horizontal surface is really safe. Every few years there's a show, both harrowing and fun. But it all leads back to making things. Trying the next new thing. And starting over with a slightly better plan. Even starting over again with a slightly better plan. This is painting. The rest, ultimately, is talking. There's nothing wrong with talking, in fact we seem to need it. But it's also important to understand that it is not painting. 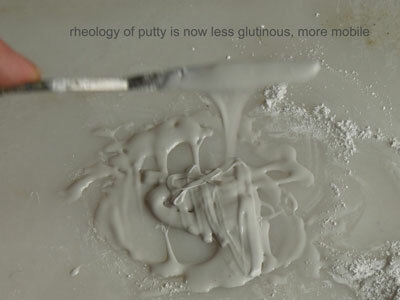 An introduction to the chalk putty medium is here. More detail, history, and formulas can be found here.